Pure Natural Schisandrae Chinensis Extract (Schisandra Chinensis in Latin) is the dehydrated mature fruits of a herb known as Schisandra chinensis and belongs to the Schisandraceae family. Schisandra is widely farmed in China, particularly the northeastern part of the country. The seeds are sown in spring and the Schisandra fruit is reaped in autumn after it is completely mature. In traditional Chinese medicine, Schisandra berry is classified as an adaptogen, an herb that regulates and normalizes the functions of the body and increases its resistance to stress. Extract of Schisandra chinensis and its preparations can promote hepatic glycogen gluconeogenesis, and can promote the liver glycogen decomposition, and the phosphorylation of fructose glucose in brain and liver, muscle strengthening; the ethanol extract could significantly reduce serum alanine aminotransferase, has a protective effect on CCl4 induced liver injury. The crude extract of Schisandra chinensis can increase the excitability of the central nervous system and improve the mental activity and work efficiency. 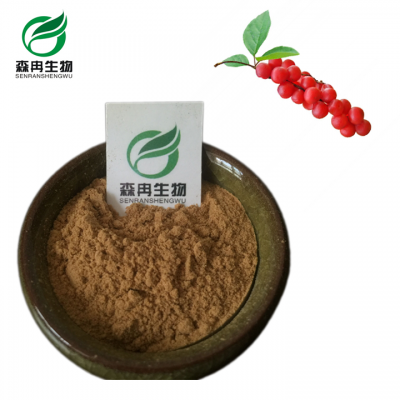 The extract of Schisandra chinensis has a good effect on inhibition of gastric ulceration, and also has a preventive effect on gastric mucosal injury caused by anhydrous ethanol. Schisandra chinensis and its extract have vasodilatation, and there is a significant increase in pressure when circulatory failure. The extract of Schisandra chinensis has the effect of enhancing cellular immunity, and it can resist aging by changing the activity of MAO and its isozyme. The increase of gomisin A and deoxy schisandrin can inhibit the excretion of urine protein, serum biochemical indexes and improvement. Gomisin A on rat homologous passive allergic skin reaction (PCA), significantly inhibited skin allergic reaction in rats. Fructus Schisandrae extract, gamma schisandin, has cytotoxic effect on leukemia and KB cells, and inhibits the metabolism of DNA, ATP and nuclear protein in cancer cells. The ethanol extract of Schisandra chinensis has inhibitory effects on Bacillus anthracis, Staphylococcus aureus, Staphylococcus aureus, paratyphoid A and B, Bacillus pneumoniae, Salmonella typhi, Salmonella enteritidis, Shigella dysenteriae, and Bacillus. Latin Name Schisandra chinensis （Turcz.）Baill.